Stop spending money on electricity or natural gas to heat your water when the sun will do it for you! Sun Ray Solar pool heating panels are metallic heat exchangers engineered to absorb solar energy. Our copper flow tubes and aluminum solar absorbing fin panels are a better choice than plastic, for those who seek greater heat conductivity, durability and fire resistant solar pool heating systems. 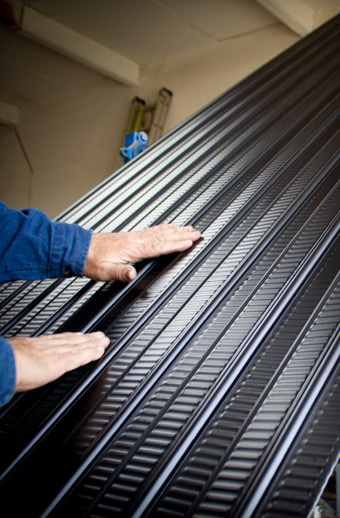 Sun Ray Absorber Plates are the most important component of a solar collector for use in solar heating systems. Absorbers are available to solar professionals and consumers for new applications or as a replacement for solar collectors. Sun Ray’s new generation of Solar Collectors; are simple efficient, durable and economical for use in Solar Water Heating Systems in residential, commercial, or industrial applications. Sun Ray Solar fin-tubes (the heat exchanger) are the core of our business. Sun Ray's highly efficient fin-tubes feature a unique design and assembly process. The fin-tubes are available to solar collector manufactures and consumers worldwide. Established in 1978 as an innovative company, Sun Ray Solar has positioned itself to be the supplier of choice for contractors and customers who demand the utmost reliability, performance and cost-effective solar heating systems. The core of our business is our unique roll formed solar collector absorber plate, the heat exchanger that transfers solar energy to fluid. Sun Ray Solar leads the way toward a cleaner and safer environment as a manufacturer of high quality solar pool heating systems, solar water heating systems, solar collectors, replacement collector absorber plates, fin-tube and headers. We pride ourselves on building high quality products for systems that will last a lifetime.